I’ll say right now that this cinnamon babka was something I made to bring to my great-aunt for her 90th birthday, so I have very few photos of the inside– it’s not like you can demand that the recipient slice into the loaf right away so you can get a picture for your blog. She did cut one slice which she shared with me, and it was delicious, so I feel comfortable posting about this recipe despite the lack of good pictures. 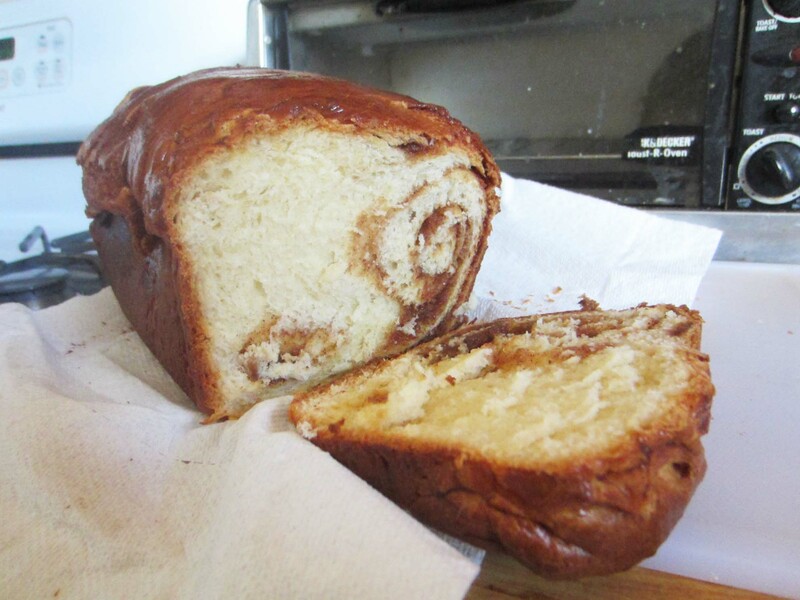 Anyway, cinnamon babka. I grew up eating a butter-enriched sweet loaf swirled with cinnamon for holidays, so cinnamon bread was always something I enjoyed. But this recipe, adapted from Cook’s Country, stands head and shoulders above that one (sorry, Dad). It’s soft and moist, and the cinnamon-sugar filling is thick and gooey, yet holds its shape in a way that I have to attribute to the flour and egg white– brilliant additions to the standard sugar-butter-cinnamon filling mixture. 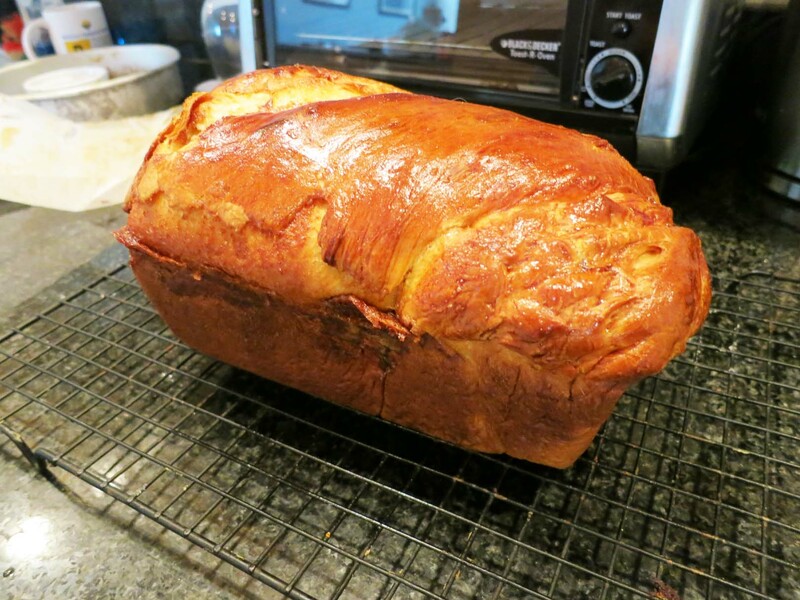 My one adaptation was to change the rising schedule– instead of the three short rises called for by the recipe, I did one long overnight rise, followed by a re-warming, shaping, and a regular short rise once the loaf was shaped. This allowed me to spread the recipe out over two days, making the dough the night before and baking it in time for lunch the next day– much more convenient than finding a single 4-hour block in which to bake bread on a weekday. I’ll definitely be making this one again, if only to finally get a good photo of the inner swirls! 1. Whisk together the milk, egg yolks, and vanilla. 2. Using a stand mixer with the dough hook attached, mix flour, sugar, yeast, and salt on low speed. 3. Add the milk mixture slowly and mix until the dough comes together. It will seem stiff at this point, but the butter will help, so don’t worry. 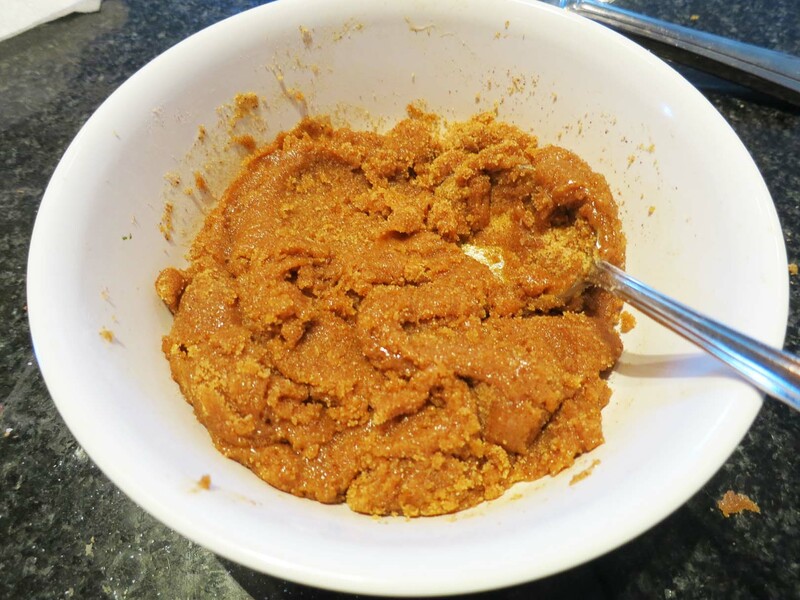 4, Increase the mixer speed to medium-high and add the butter, one tablespoon at a time, until incorporated. 5. Continue to knead until the dough is smooth and comes away from the sides of the bowl, about 10-12 minutes. Don’t skimp on this step! 6. Remove the dough from the mixer bowl, spray the bowl with cooking spray, and replace the dough. Cover with plastic wrap and let the dough rise in the refrigerator overnight. 7. The next morning, take the dough bowl out of the fridge and put it in a warm place to come back to room temperature (maybe an hour). Below you can see the dough pre-refrigerator rise, and post-room temperature rise. I know the photo angle makes them look the same size but I promise they’re not. 8. Once it’s warmed up a bit and softened, put it on a floured board and roll out to a 14×20″ rectangle. 9. 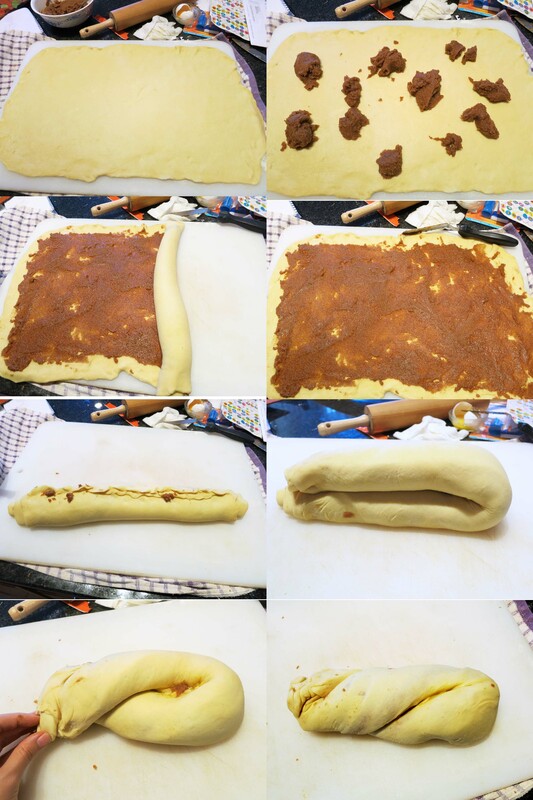 Spread the filling (reserving 1 tbs) over the dough, leaving 1/2″ margin on all sides, then roll up from the short side to make a 14″ roll. I totally forgot to reserve the filling here, so if you do, don’t worry about it. Also, the easiest way to spread the filling evenly is to dollop it over the dough and use an offset spatula to gently coax the blobs to meet each other. 10. Gently stretch and roll the 14″ roll until it reaches 18″. 11. Spoon the reserved filling over the top of the roll, then fold the roll in half over itself and pinch the ends to seal. 12. Twist the roll twice on itself to form a neat roll. Place the roll, seam side down, in a parchment-lined loaf pan. 13. Cover and let rise in a warm place for an hour, until doubled in size. 14. Beat the remaining egg and brush it over the top of the risen loaf, then bake at 350 degrees F for about 45 minutes. If it starts to go too brown at the 30-minute mark, tent it with foil for the remaining time. 15. Let cool in the pan for about 20 minutes before lifting out of the pan with the parchment. Yeah, I know the swirl is lopsided, but that’s just the very end of the loaf, and it’s the end where the two ends of the roll met, so of course it won’t look as pretty! You can see the beginnings of a second swirl in the lower left-hand corner– I”m sure the middle of the loaf looked gorgeous. Next time I make it (and there will be a next time) I’ll take more pictures!